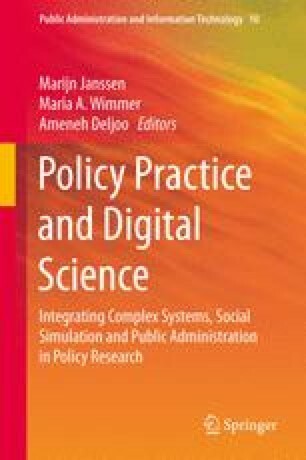 This chapter seeks to provide a brief introduction to the method of microsimulation and its utility for the development of public policy. Since the inception of microsimulation in the 1950s, its use for policy purposes has extended from the economic to other domains as data availability and technological advances have burgeoned. There has also been growing demand in recent times to address increasingly complex policy issues that require new approaches. Microsimulation focuses on modelling individual units and the micro-level processes that affect their development, be they people’s lives or other trajectories. It comes in various types, for example along the dimensions of arithmetical or behavioural, and static or dynamic. It has its own distinctive model-building process, which relies on empirical data and derived parameters with an insertion of chance to simulate realistic distributions. The particular utility of microsimulation for policy development lies in its ability to combine multiple sources of information in a single contextualised model to answer ‘what if’ questions on complex social phenomena and issues. The Modelling the Early Life Course (MEL-C) project was funded by the Ministry of Business, Innovation and Employment. Data were made available by the Christchurch Health and Development Study, University of Otago. This section highlights a number of existing microsimulation models used for policy purposes. The list is not intended to be exhaustive, merely to provide an indication of the broad sweep of models in use across various domains and countries. There are useful reviews and compendia of existing microsimulation models that describe their features in more detail (for example: Li and O’Donoghue 2012; O’Donoghue 2001). APPSIM, developed by the National Centre for Social and Economic Modelling (NATSEM), is a dynamic model which simulates the life cycle of 200,000 individuals (1 % sample of census) from 2001 to 2050. It shows how the Australian population develops over time under various scenarios, and allows the social and fiscal impacts of policy changes over time to be simulated. EUROMOD, based at the Institute for Social & Economic Research, University of Essex, is a static tax-benefit model for the European Union (2000s). It enables researchers and policy analysts to calculate, in a comparable manner, the effects of taxes and benefits on household incomes and work incentives for the population of each country and for the European Union as a whole. FEM, developed by the RAND Roybal Center for Health Policy Simulation, is a demographic and economic simulation model designed to predict the future costs and health status of the elderly and explore the implications for policy. It uses a representative sample of 100,000 Medicare beneficiaries aged 65 and over drawn from the Medicare Current Beneficiary Surveys. Each beneficiary in the sample is linked to Medicare claims records to track actual medical care use and costs over time. LIFEPATHS, developed by Statistics Canada, is a dynamic model of individuals and families from an 1872 birth cohort, to today. It creates synthetic life histories from birth to death that are representative of the history of Canada’s population. It can be used to evaluate government programmes, or to analyse societal issues of a longitudinal nature, e.g. intergenerational equity. MIDAS is a dynamic population model. Starting from a cross-sectional dataset representing a population of all ages at a certain point in time (early 2000s), the life spans of individuals are simulated over time. So new individuals are born, go through school, marry or cohabit, enter the labour market, divorce, retire, and finally, die. During their active years, they build up pension rights, which result in a pension benefit when they retire. POHEM is a dynamic microsimulation model intended to represent the lifecycle dynamics of the population. The simulation creates and ages a large sample until death. The life trajectory of each simulated person unfolds by exposure to different health events. The model combines data from a wide range of sources, including cross-sectional and longitudinal surveys, cancer registries, hospitalisation databases, vital statistics, census data, and treatment cost data as well as parameters in the published literature. SADNAP is a dynamic microsimulation model for estimating the financial and economic implications of an ageing population and evaluating the redistributive effects of policy options. It simulates the life paths of a sample of the Dutch population using transition probabilities on demographic events. The model uses administrative data sets on pension entitlements and payments. STINMOD is a static microsimulation model of Australia’s income tax and transfer system, developed by NATSEM. The model is mostly used to analyse the distributional and individual impacts of income tax and income support policies and to estimate the fiscal and distributional impacts of policy reform.